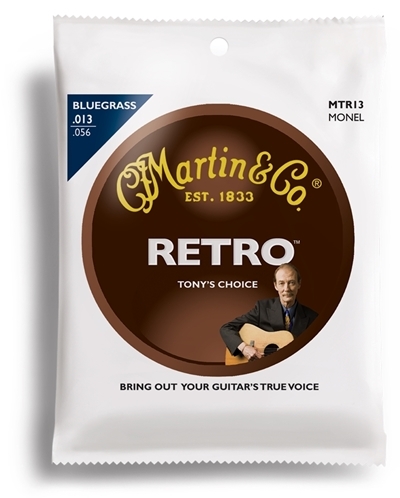 Tony Rice, the legendary bluegrass artist, played Martin Monel strings on a 1935 D28 until they became unavailable in the 1970's. Missing the tone for decades, Tony worked hand-in-hand with the talented sound engineers at Martin Guitar to bring back to life his favorite sound - Martin Monels. When the new formula was perfected and Tony put them on his guitar, he said "Welcome back, old friend." Tony's favorite thing about Martin Monels is that they don't change the timbre of the guitar. To Tony's ears, the compound, nickel-based alloy mellows very quickly to allow the natural, woody sounds of the guitar to pour from the sound hole, unaltered, from the very first strum. Long lasting and great tone, stay in tune even after sitting for a day or two. I really like these strings on my Little Martin, the medium gage gives the right tension with the shorter scale length. I use the light gage Retros on my OO. I hope to see Retro strings for the mandolin in the future. Many people do use this set on Martins so they may be to your liking. Monel steel is generally regarded as a warmer sounding string. If that is what you are after these should work well for you. If you are interested in a brighter or more brilliant tone you might consider a different option.